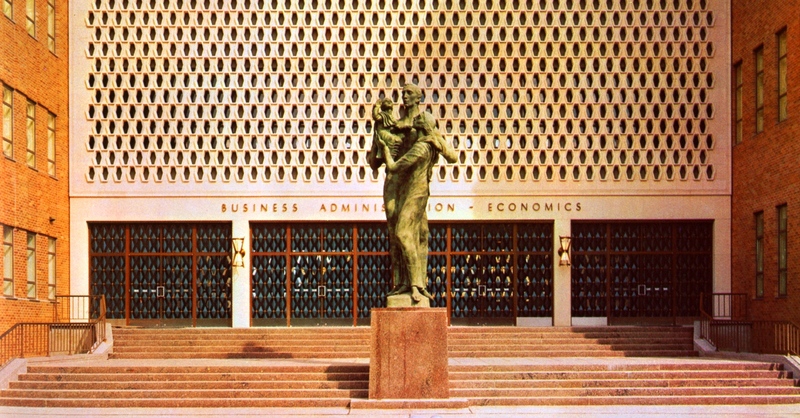 Above: The image of Hermes, patron saint of the business school, is displayed on the west side of the Texas Union building, along with the patron saints of law and engineering. Choosing a patron saint can be complicated. Just ask the business school. 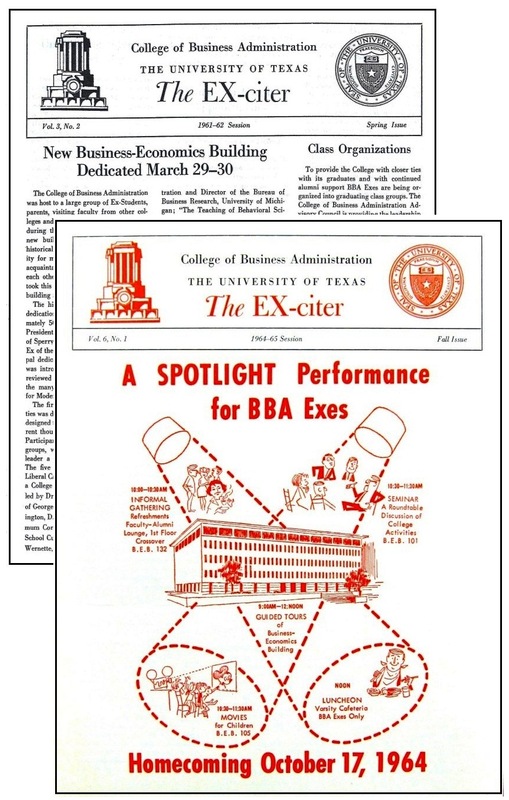 Business classes were first offered on the Forty Acres in 1912, initially organized as a department under what was then the College of Arts and Sciences. But after a decade of rapid and prosperous growth, it was time for the department to leave the nest and fly on its own. 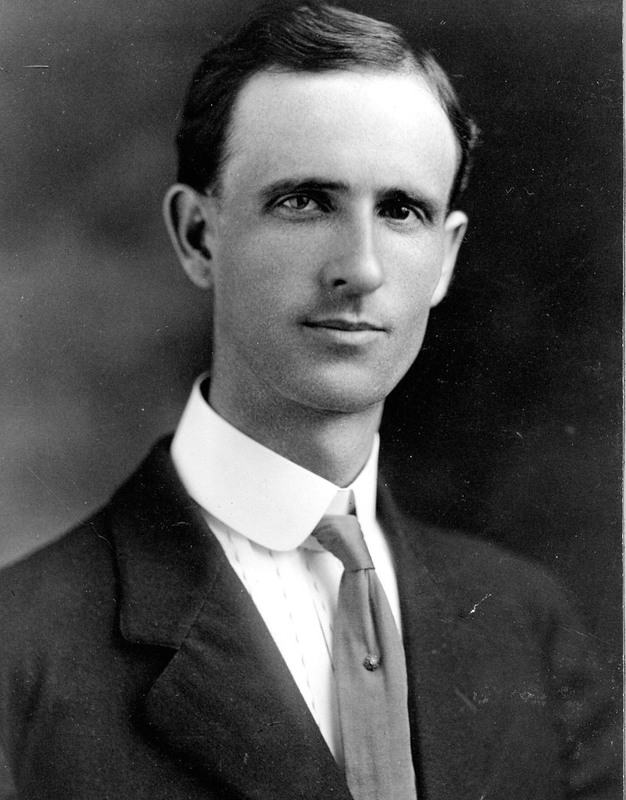 In early April 1922, department chair Spurgeon Bell learned that UT President Robert Vinson planned to recommend a separate School of Business Administration to the Board of Regents. The regents’ approval was assured at their upcoming July meeting, and Bell would be named the school’s first dean. Bell shared the exciting news with his students, who quickly set about planning a celebration. 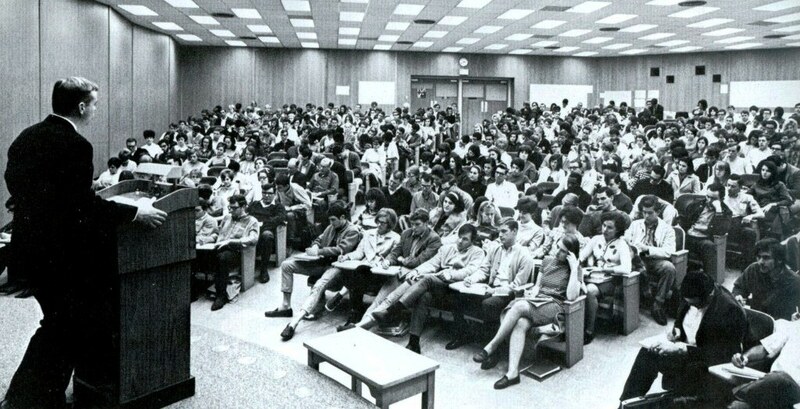 With Bell’s encouragement, the business students met Friday, April 7th in the auditorium of the old Law Building (where, perhaps appropriately, the Graduate School of Business Building stands today). A committee was appointed to organize the first annual business administration banquet, to be held in early May. A second committee addressed the issue of a business school identity. Above right: The old Law Building, near the corner of 21st and Speedway Streets, where the Graduate School of Business Building stands today. 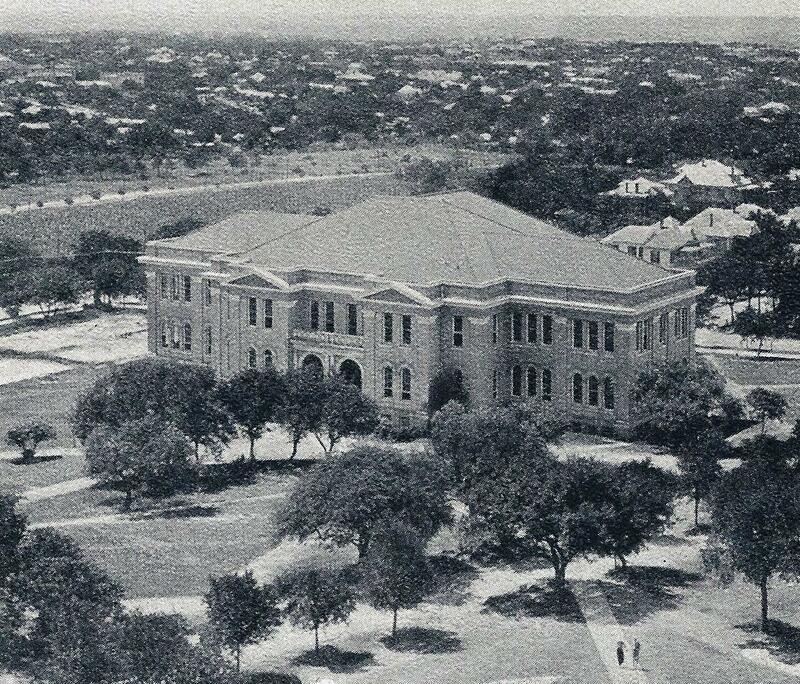 The houses in the upper right have been replaced by the Perry-Castaneda Library, and the field in the upper left is now the Jester Center Residence Hall. By 1922, the University’s engineering and law schools had mascots – “patron saints” – around whom their respective students and alumni had developed a healthy espirit de corps. The law school’s Peregrinus, or “Perry,” (image at left) was invented on a chilly afternoon in December 1900, during a class in equity. The professor was lecturing on Ancient Rome and the praetor peregrinus, a traveling magistrate who administered justice in the less populated regions of the Roman Empire. An unprepared student in the class was quizzed on the subject. “I don’t know,” he mumbled. “The peregrinus was probably some kind of animal.” The class burst out in laughter, but fellow student Russell Savage, sitting in the back of the room next to a chalk board, doodled a likeness of the imaginary creature that was later adopted as the law school mascot. 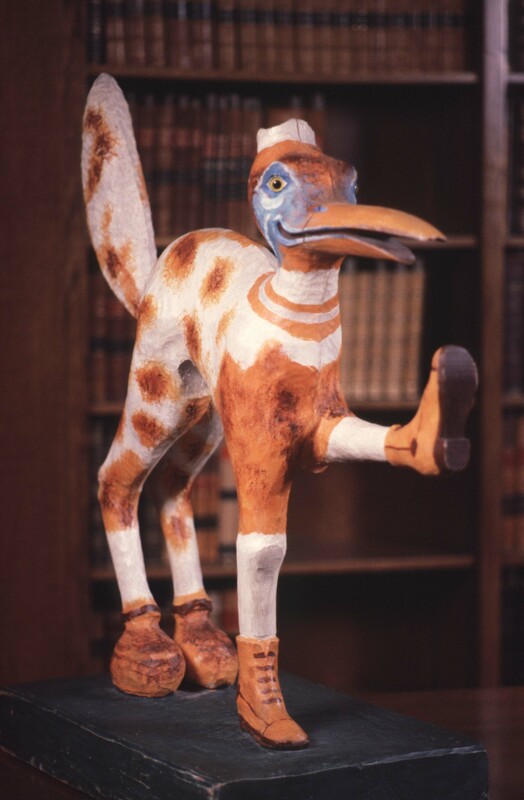 With four legs, a bushy tail, and a long beak, “Perry” was meant to symbolize the prowess of lawyers in their chosen profession. A wooden likeness of the Peregrinus was commissioned, and fashioned by local woodcarving master Peter Mansbendel. Kept secure, it made special appearances and attended the law banquets where it was ceremoniously passed from the graduating seniors to the juniors. Above: Senior law students carry the Peregrinus at spring commencement. The patron saints of engineering and law had storied histories, helped to fuel an ongoing campus rivalry between the two schools – both mascots had been kidnapped by the “enemy” – but most important, they provided a symbol of pride and common loyalty. The business students wanted to join the fun, and sought an icon they could call their own. Initially, the mascot committee considered using the shark. “Because of the prevalence of calling students in the [business] department sharks,” explained The Daily Texan, “it was suggested that an insignia of a shark be used to denote the department.” It was an obvious choice, as much of the campus had nicknamed business students “sharks” for years. But it provided no central character around which the school could rally, and, quite frankly, the label wasn’t always a positive one. Professor Bell urged his students to try again, and look for a mascot that represented the best in business endeavors. For the next several weeks, the committee agonized over the decision. On the evening of Monday, May 8, 1922, business students and faculty gathered at the Stephen F. Austin Hotel for their first annual banquet. As part of the proceedings, the mascot committee revealed their final recommendation: Hermes, the Ancient Greek god of commerce, who was noted for his eloquence, speed, shrewdness, and wisdom. The idea met with the instant approval of everyone, and a framed “rough copy” of the new patron saint was placed on the head table. In October, as the academic year began, business students pursued a better representation of their new patron saint. They contacted Peter Mansbendel, the same master woodworker who had helped the law school with the Peregrinus. Several designs were considered, including one of Hermes sitting on a pot of gold, but the most popular was a standing Hermes with an American Bald Eagle at his feet. Mansbendel fashioned a miniature prototype out of clay that was officially approved and accepted at a business school assembly on November 28th. Fundraising for the final version began in earnest with the spring, but the needed monies weren’t acquired in time for Mansbendel to complete the project for the 1923 banquet. Instead, Hermes was readied over the summer, and then spent many months safely locked in a vault owned by the American National Bank in the Littlefield Building downtown. 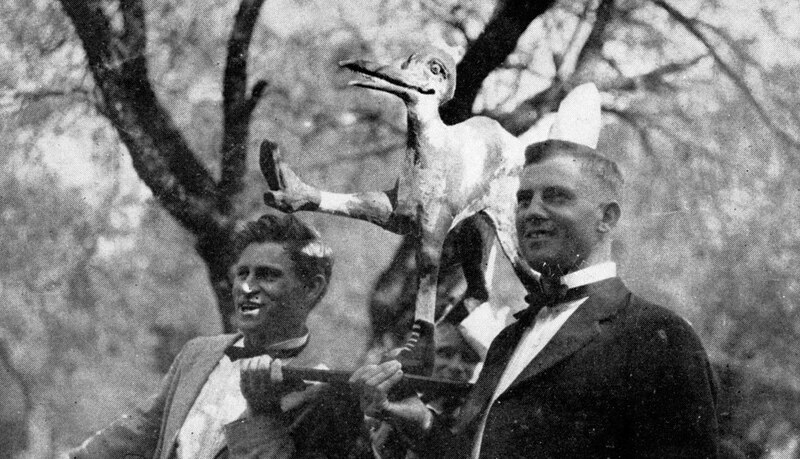 He finally made his debut at the May 12, 1924 business banquet, and was the star of the show. Above right: The original clay rendering of Hermes. Thirty-eight inches tall and made from pine, Mansbendel’s Hermes wears winged sandals as a symbol of his swiftness. With his left hand near his heart he holds a caduceus, a staff with two entwined snakes that was a symbol of commerce to the Ancient Greeks, and declares Hermes the authority of strategic negotiations. In his right hand he carries a bag of gold, a trophy of his successful commercial transactions. An eagle sits at his feet, evidence that the business school’s Hermes is “one hundred percent American” despite his distant origins. For UT business students, their patron saint is a symbol of strength, success, innovation, and efficiency in the commercial enterprise. 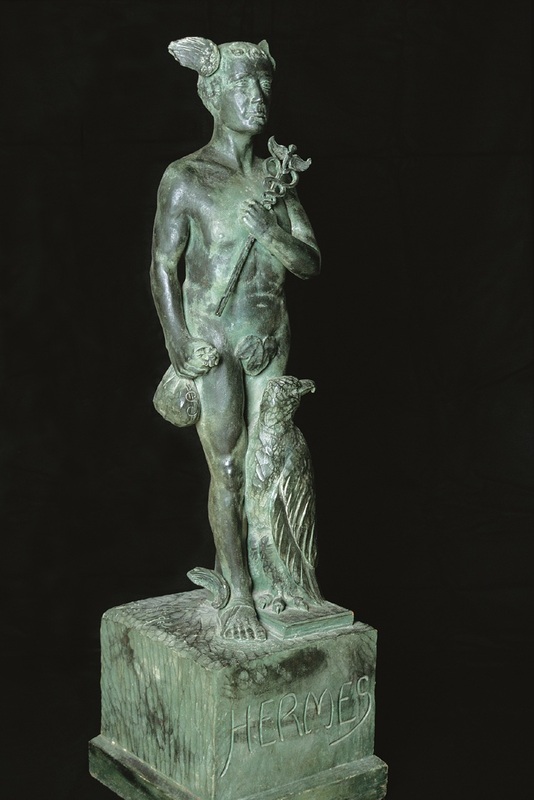 Above: Peter Mansbendel’s rendering of Hermes. While Hermes was kept safely out-of-sight for most of the year, other schools, perhaps jealous, schemed to capture the patron saint for themselves. 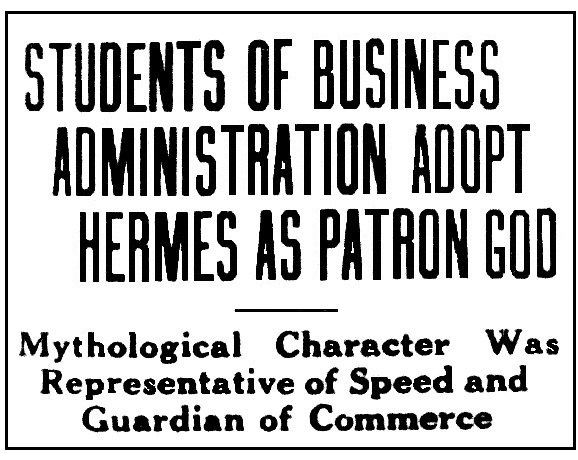 At the1927 business banquet, a contingent of law and engineering students conspired together, and rushed the banquet floor with the intent to steal Hermes away for their own evil purposes. A brief but raucous wrestling match ensued, and the unified business students managed to repel the invasion force. Since then, no one has dared to attempt a patron saint-napping. For another two decades, Hermes was a regular guest at the annual business banquet, but after World War II, when a wave of returning veterans nearly doubled UT’s enrollment in just a few years, the event became impractical. Instead, Hermes was placed on display in Dean J. Anderson Fitgerald’s office in Waggener Hall. 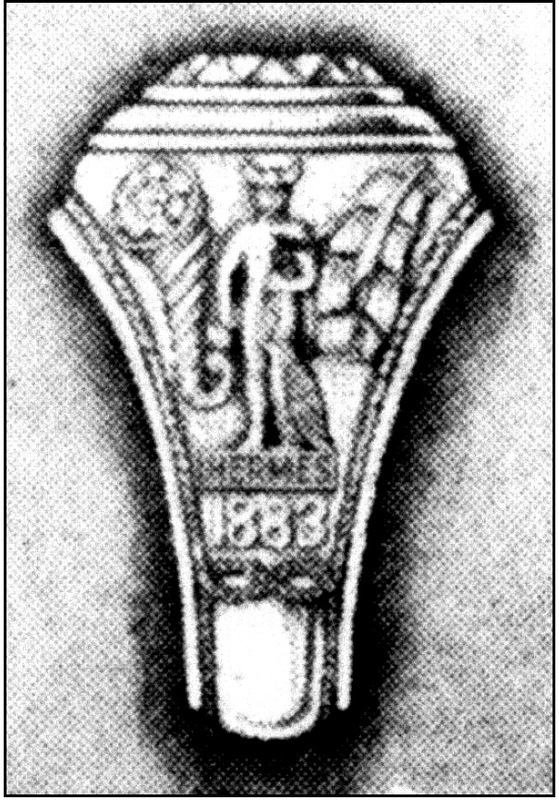 Through the 1950s, the patron saint could be seen on the senior rings of business students (photo at left). 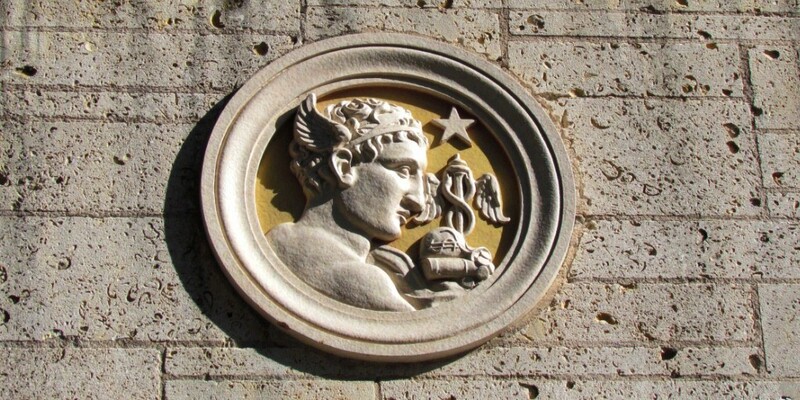 Today, Hermes is still a proud tradition of the McCombs School of Business. He stands in the undergraduate student office, surveying his dominion, and inspires business students to be their best in leadership, innovation, ethics, and entrepreneurship. Above: Pals forever. 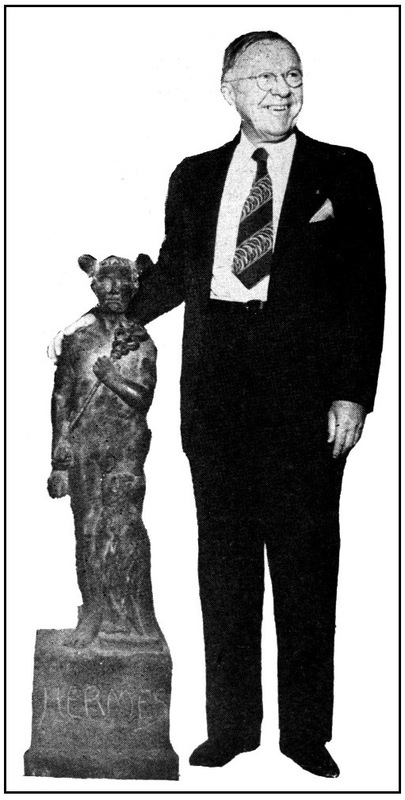 Business Dean J. Anderson Fitzgerald and Hermes in 1947. Above: The original west entrance to the Business-Economics Building. For the business school, it was a dream come true. 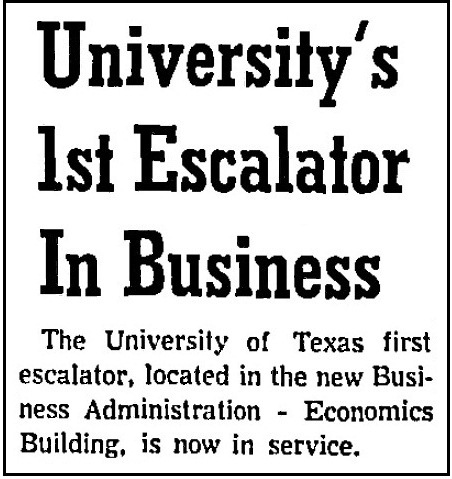 On February 2, 1962, the swanky new Business-Economics Building, the largest teaching facility yet on the Forty Acres, hosted its first classes. Business Dean John White was elated with the new digs. So were the students, who promptly dubbed the edifice the “Big Enormous Building.” Though much of it has been renovated over the past half century, the original “BEB” was, in many ways, a modern marvel and campus trend-setter. At the University of Texas, business classes made their debut in 1912, when UT alumnus Spurgeon Bell (photo at left) was hired to found a “business studies” department within the College of Arts and Sciences. The facilities, though, weren’t ideal. 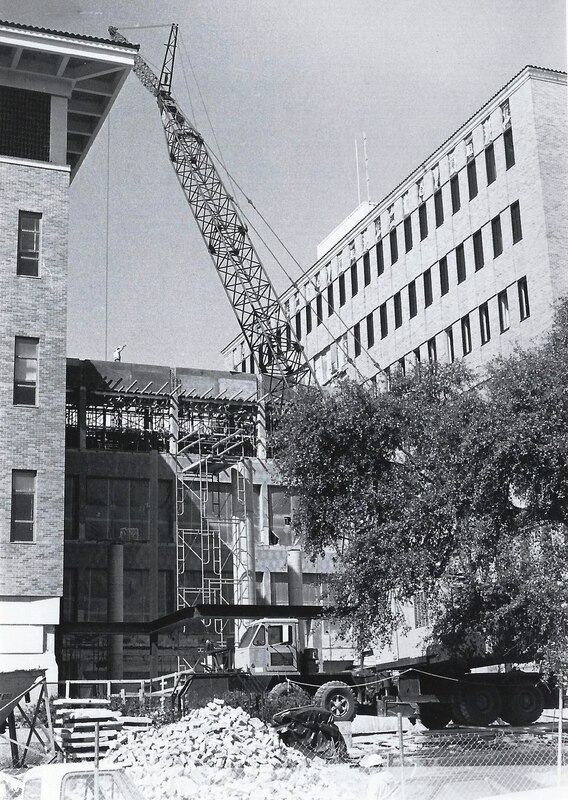 As UT’s growth outpaced its funding, resources to construct new buildings simply weren’t available. Temporary pinewood shacks were built instead. Crude and without proper foundations, UT President Sidney Mezes purposely left them unpainted in the forlorn hope that the state would be so embarrassed by their appearance and replace the shacks with adequate buildings. Above: In 1912,”G” Hall for business studies stood in front of today’s Gebauer Building. The business studies department was assigned to “G” Hall, located in front of today’s Gebauer Building. Poorly heated by pot belly stoves, Bell had to arrive early on cold days to stoke the coals left by the custodian overnight, and then gather more firewood from a stack behind the building. Despite the primitive conditions, the business department grew, matured, and was made a separate school in 1922. 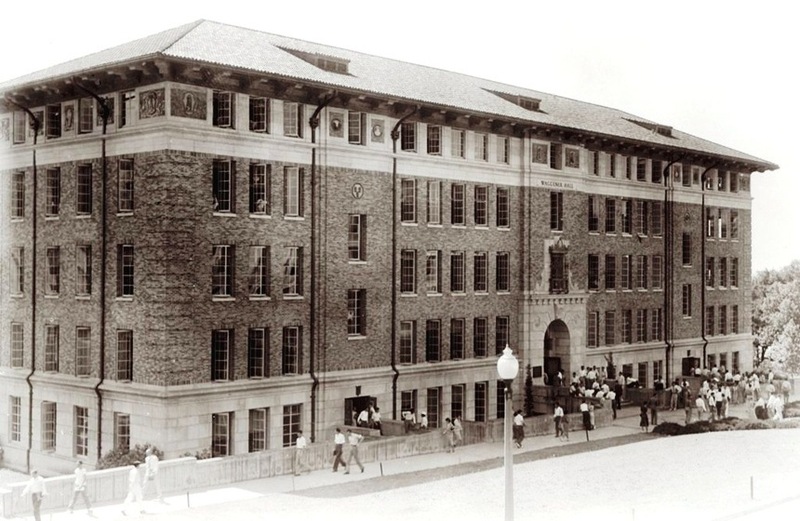 A year later, the 1923 discovery of oil on University-owned West Texas land offered the promise of better quarters in the future, but it wasn’t until 1931 that Waggener Hall was opened along the west side of Speedway Street. Named to honor Leslie Waggener, UT’s first president, the hall was intended for business administration, a message made clear though the building’s ornamentation. Twenty-six terra-cotta medallions placed just below the eaves portrayed some of the exports of Texas at the time: cotton, oil, pecans, maize, wheat, cattle, and lumber, among others. However, with space on the campus at a premium, business initially had to share the building with the math, English, and public speaking departments, along with an anthropology museum that filled the top floor. 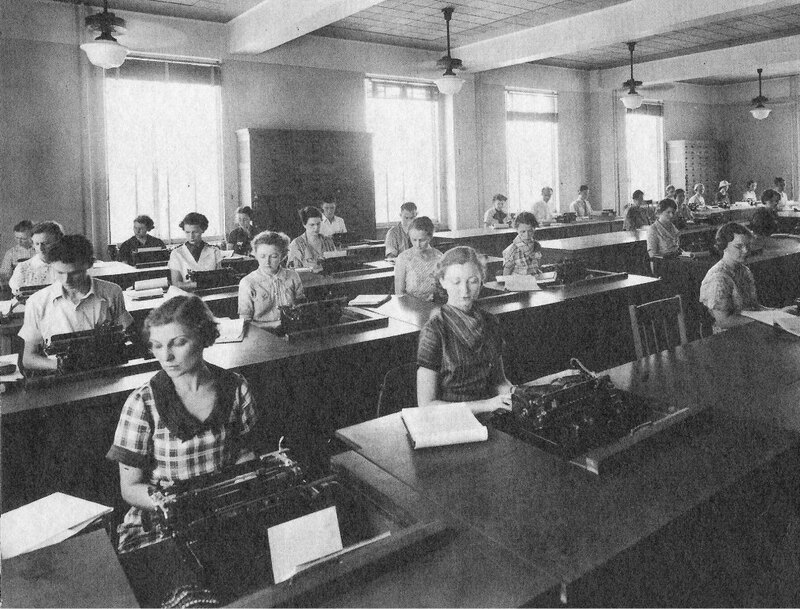 Above: A typing class in the late 1930s. Ceiling fans regularly hummed in the un-air conditioned classrooms. 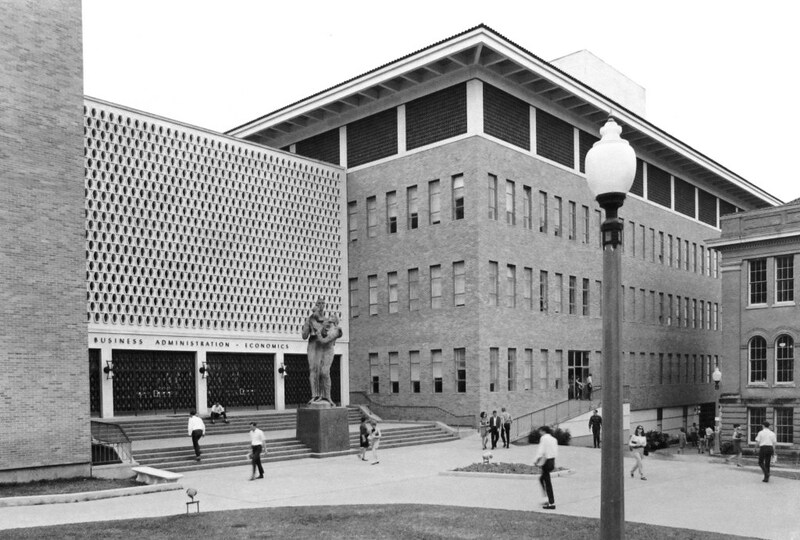 The new quarters were a boon for the business school, but as its classes grew more popular with UT students, Waggener Hall was short on space within a decade, and then almost unmanageable after World War II, as thousands of returning veterans enrolled in the University under the G. I. Bill. It became something of an annual tradition for the business deans to lobby the UT administration for a new facility. In 1958, the University observed its 75th anniversary. Along with the many campus celebrations, a Diamond Jubilee Commission was created to “chart the University’s next 25 years.” Appointed by UT President Logan Wilson, the commission tackled issues ranging from academic programs, enrollment, research, and student life, and created a series of recommendations intended to bring UT up to the top tier of the nation’s universities. In response, President Wilson formally launched a “Ten Year Plan,” intended to overhaul degree programs and improve facilities. A new headquarters for the College of Business Administration was among the priorities, and the Board of Regents approved the $4 million for construction. Ground was broken in July 1959 and the building was ready for use by spring 1962. 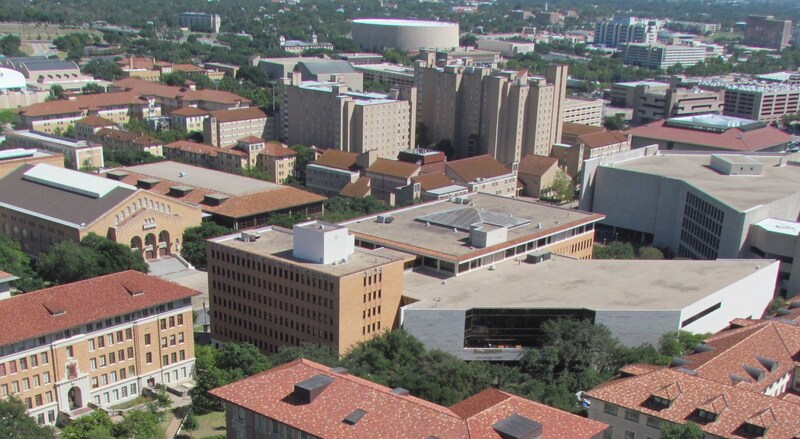 At the time, UT’s academic year opened in late September, with fall semester finals scheduled in January, just after the holiday break. With a brief, ten-day intersession, the spring semester began in February. 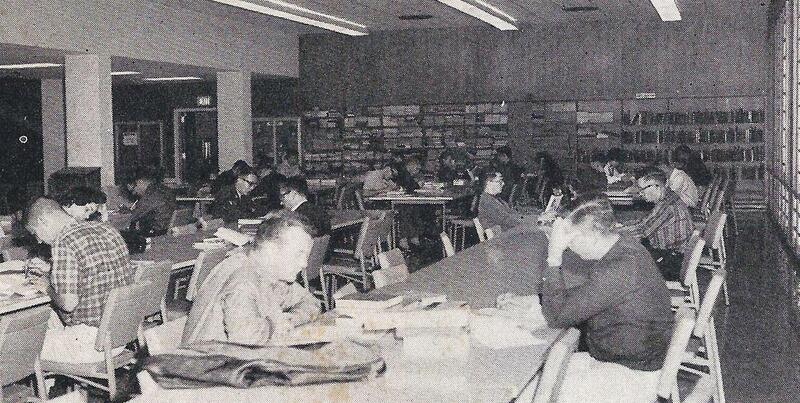 For the business school, the 1962 intersession was a great scramble, as all of the filing cabinets, office desks, teaching materials, and library books had to be moved from Waggener Hall to the new building in time for the spring semester start on February 2nd. A winter ice storm that pelted Austin mid-week only added to the chaos. 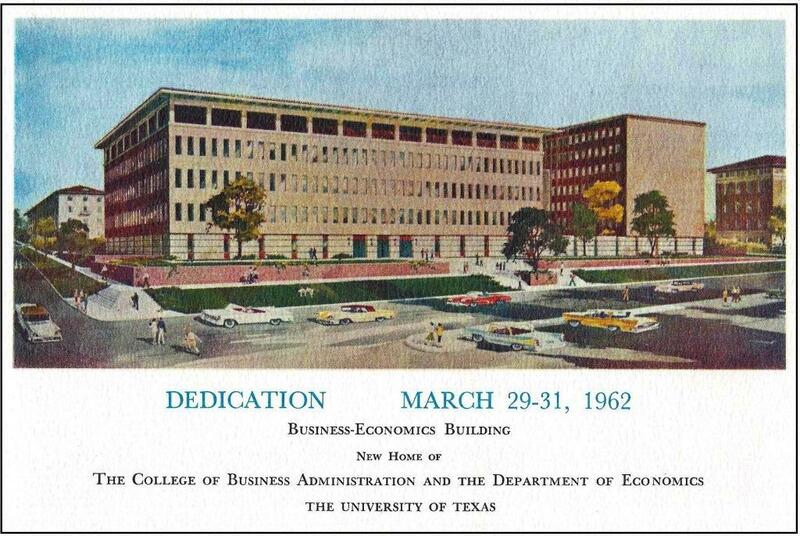 Above: The invitation to the Business-Economics Building dedication. Formally dedicated at the end of March, the Business-Economics Building – the “BEB” – was touted by some as the largest business learning facility in the Southwest. 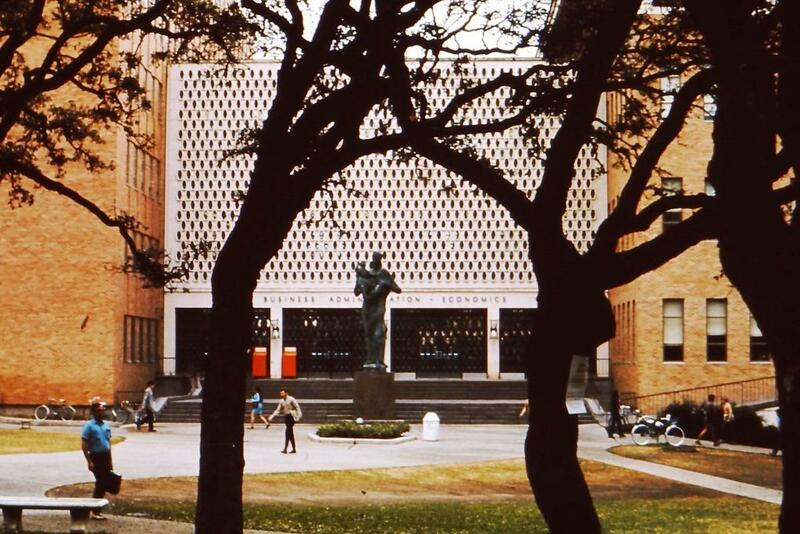 The faculty initially requested a contemporary structure, both in appearance and design, but the University administration felt that some adherence to the Mediterranean Renaissance style found on the rest of the Forty Acres was preferable. While the building was definitely modern, its limestone, brick, and use of Spanish red tile still identified it as part of the campus. Above: The main entrance to the BEB faced west, toward the Forty Acres. The BEB was organized into three distinct components, each designed around specific functions. On the south end was a five-story, rectangular classroom building constructed around a central court from the second to fifth levels; the first level of the court was occupied by a 400-seat auditorium (photo at left). Functionally, the court provided a light well for the classrooms along the inside, but also boasted two fountains with reflecting pools, landscaping, and benches. Along with the main auditorium, the first floor held four other theater-style classrooms for 100 to 150 students each. All were outfitted with modern sound and projection equipment, and some had mounted television monitors, a medium that had become popular less than a decade before. Elsewhere in the building were circular seminar rooms with tiered seating – the first on the campus – along with accounting, statistics, management, and marketing labs, study halls, interview practice rooms, and a 10,000 volume business library (right) with room for 270 students. A series of large exhibit cases fronted with plate glass simulated store front windows to show off retail marketing class projects. Extensive use of mosaic tile was used as wainscoting along the hallways of the classroom building, with different geometric patterns – diamonds, stars, and cubes – in blue, brown, and yellow hues on each floor. A solar screen of Spanish red tile in a quatrefoil design covered the outside windows along the top floor, and while the roof was flat, its broad eaves with coffered soffits were similar to those found elsewhere on campus. The north end of the BEB was a seven-story office building which housed the faculty and dean, and at the time was the second tallest structure on the campus, next to the Tower. Each level was reserved for a specific department. Starting from the first floor: finance, dean and career placement offices, accounting, economics, management, business services, and marketing. For a short time, the Institute of Latin American Studies shared the seventh floor until more appropriate quarters could be found. Above: A single bank of “up only” BEB escalators on the second floor of the crossover. The main west entry to the building is seen on the right. A protected crossover linked the classroom and office units. 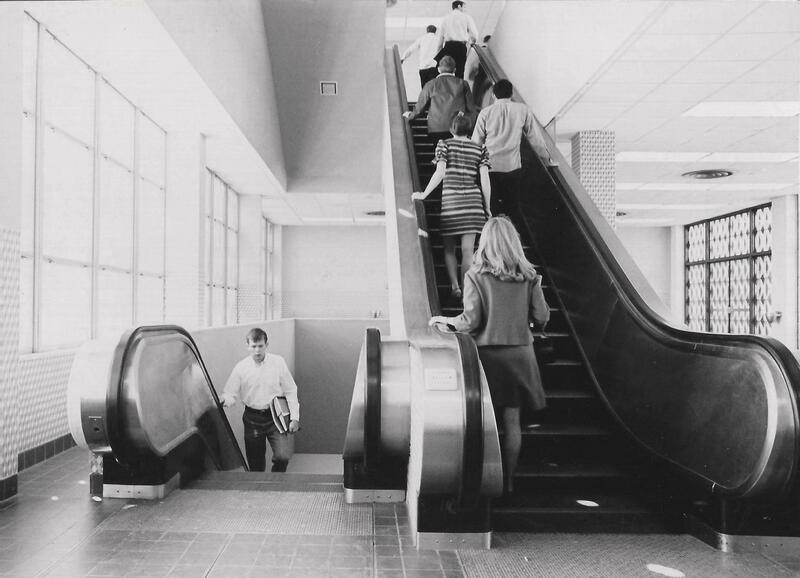 It functioned both as a corridor and housed the University’s first escalator. The high-speed moving staircase, though, only went up; there was no down escalator. 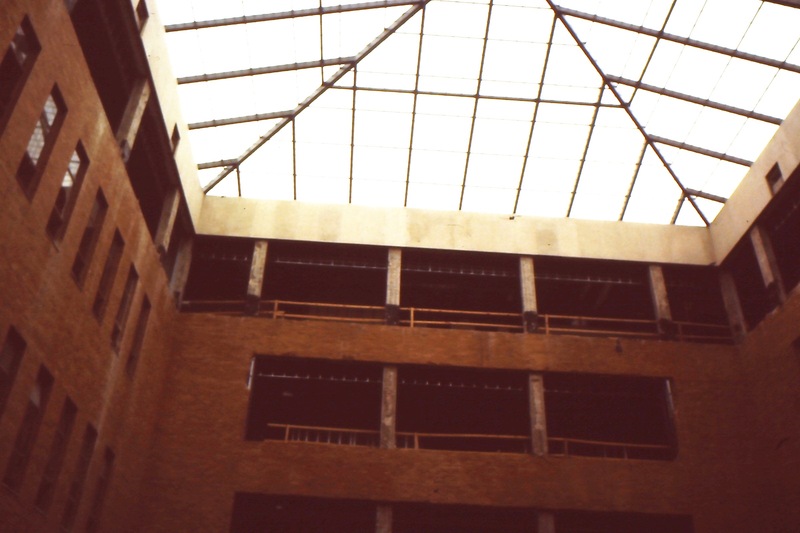 While the BEB was furnished with elevators and stairs, a persistent joke was that students and faculty would all wind up on the top floor at the end of the day. 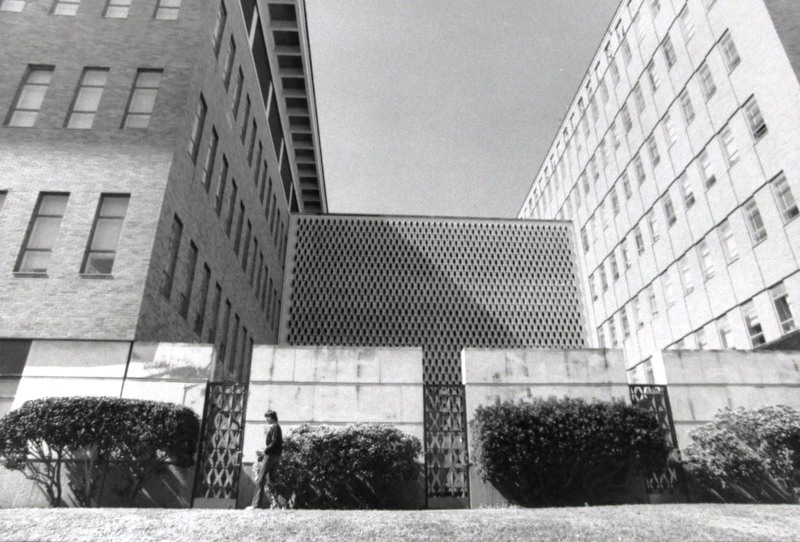 Similar to the top floor windows on the classroom building, the mostly glass crossover was sheathed in a solar screen, this one a perforated concrete wall, to block some of the heat from the Texas sun. So, too, was the front entrance of the BEB, found on the west side of the crossover. The glass doors were covered in a deep blue diamond pattern made from steel. Because of the sloping terrain, visitors entered at the second level. Just behind the crossover, on the east side along Speedway Street, a walled patio provided space for faculty and alumni gatherings. An alumni lounge, next to the dean’s office in the office building, was equipped with a kitchenette, along with doors that led out to the patio. Above: Behind the crossover, on the east side along Speedway Street, an enclosed patio served as a space for faculty and alumni events. In the 1980s, the area was enclosed and made the McCombs School’s Hall of Honor, though alumni events are still held here. Above: Charles Umlauf’s “The Family” guarded the main entrance to the BEB. The opening of the BEB galvanized the business school. As part of the University’s Ten Year plan, the undergraduate and graduate programs were reviewed, revised, and strengthened. A Business Honors Program was founded. Typing classes were discontinued (though still offered through University Extension) in favor of courses in mathematical analysis, leadership development, and the use of technology. While the BEB was under construction, Business Dean John White invested a sizable $75,000 to purchase an IBM 1620 Data Processing System (above left), a room- size computer that could perform over 1,500 calculations per second. It was installed in time for the BEB dedication, and was a highlight of the building tour. 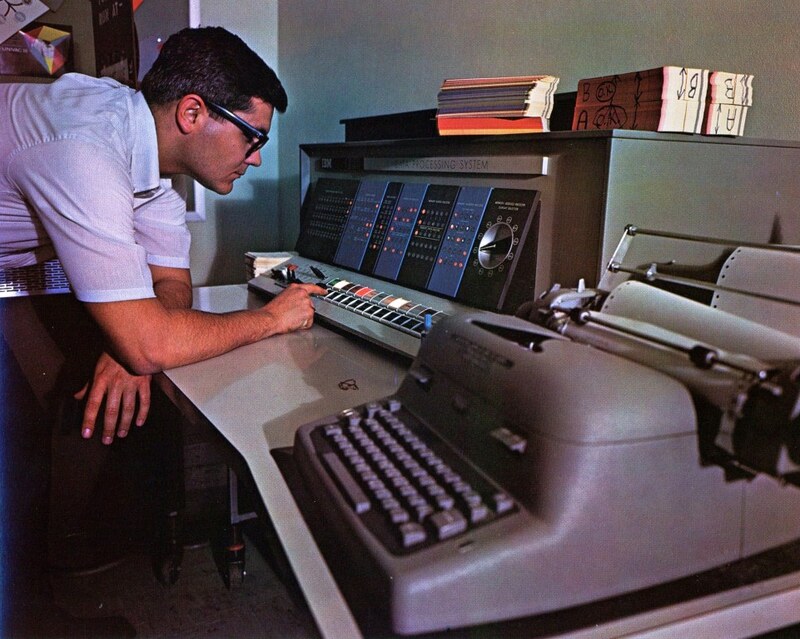 “In preparation of the computer world of the Seventies and Eighties, all students in the College of Business explored the mysteries of this fantastic machine,” explained the 1965 Cactus yearbook. Along with academics, the business school used the BEB to initiate an outreach program. In 1960, an Advisory Council was created to both help with fundraising and “provide an avenue of direct liaison between the faculty and the business community.” The school’s first alumni newsletter, The Ex-Citer, was published three times a year, and special events, including an annual homecoming during football season, were held on the alumni patio. Teaching Center was built across the street to the south in 1982 to ease overcrowded classrooms, and a pedestrian bridge added to connect it to the rest of the business school. A few years later, the BEB underwent a significant renovation. The central courtyard was covered to create an atrium (top left), classrooms were retooled and upgraded, the original decorative tile along the hallways was removed, and the alumni patio enclosed in favor of a “Hall of Honor.” (photo at right) The complex was renamed the George Kozmetsky Center for Business Education and formally dedicated in 1986. A later, minor renovation was completed in 2008. Citing problems with pigeons nesting among the tiles, the solar screen along the top row of windows of the classroom building was removed. 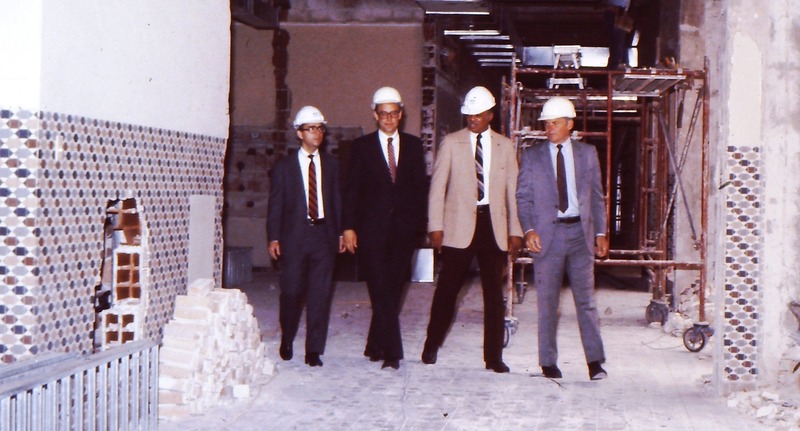 Above: Business Dean Robert Witt (left) inspects the progress of the 1980s renovation to the Business-Economics Building. The mosaic tile on the wall – a different pattern for each floor – was removed. 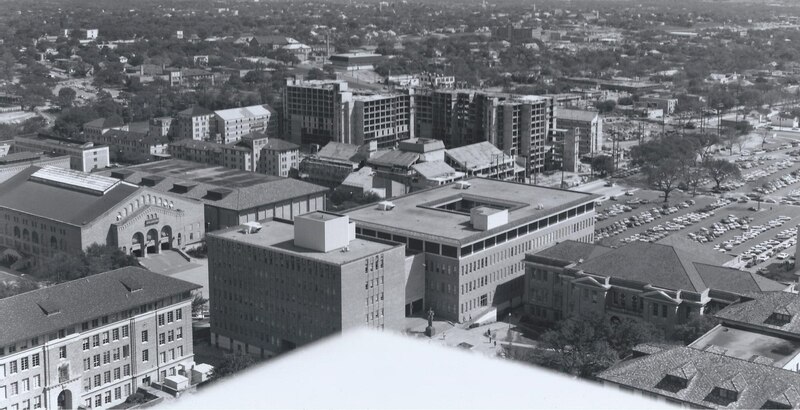 Above: A then and now look at the Business-Economics Building from the UT Tower observation deck. The image on top was taken in 1968, while the Jester Center residence hall was under construction. “The Family” statue can be seen in front of the west entry into the BEB crossover. The old Law Building (1908) was then home to the anthropology department. The photo above was taken in 2012. The Graduate School of Business Building was connected to the BEB in 1975, and later renovations enclosed the courtyard of the classroom building. Click on an image for a larger view.